Like any organ in the body, hair is something that we all have . People tend to focus and spend a lot of money taking care of their skin, but they dont do the same about their hair. in fact they all tend to take care of them only when they visit a salon 3 or 5 times a year in treatment and style which are unhealthy or damaging to it, but what about the other 360 days? so why people spend lot of time taking care about their skin but not their hair. the answer they think the shampoo and conditioner using on daily basis is enough, but not all products deliver results. If you live an overall healthy lifestyle, then it might very well be enough, but for the average person there is much that can be done to achieve and sustain a healthy head of hair. The product you use and how you use it, your hairstyle and how you achieve the results, your diet and even weather can have an effect on the overall health of your hair. How does diet affect your hair? like fingernails, hair is also made from protein and need protein to stay healthy and grow. Zinc and other nutrients help with the health of your hair, with that been said if you overall eat healthy diet won't have much to worry about. but If you don’t eat healthy diet then some foods that you can cycle in to help promote healthier hair. Hair loss prevention: If you are struggling with hair loss, thats because you are not getting enough iron in your diet.Try mixing in some shellfish, dark leafy greens, soybeans, lentils, organ meats (like liver) or fortified grains like cereals and pasta. Tropical fruits high in vitamin C will help protect your hair from breakage and cinnamon will help with circulation. Dull Locks: if you have dry hair and lost of shine, beta carotene can help restore that. also carrots, sweet potatoes, cantaloupe , mango and pumpkin are all wonderful source for beta carotene. also sardines, mackerel and salmon are full of omega 3 and fatty acids will help restore shine and promote hair growth. To Promote Growth: greek yogurt is good for that. it has an ingredient that promotes blood flow in your scalp and rich with protein. also Eggs will help in this area. For Thickness: if you aren’t getting enough protein in your diet it may start to thin. Try adding a lean poultry (chicken or turkey). Full-ness: you need to have enough zinc in your diet. Try oysters, crab, beef, lobster and some cereals to add more zinc. There are of course others that can work as well. CHICAGO BUSINESS HALL OF FAME! L’Or D’Afrique Inc is among a very small group of companies that have won the Best of Chicago Award for five consecutive years. This distinction has qualified L’Or D’Afrique Inc for the 2014 Chicago Business Hall of Fame. See why this Moroccan argan oil for hair and skin is voted chicago's best products for 4 years in the row. 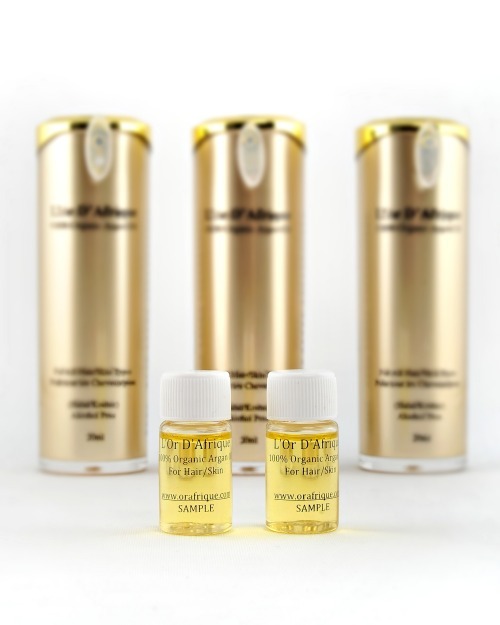 L'or D'afrique Argan oil hair treatment. We are passionate about providing our customers with hair care that is safe, effective, and reliable. As a company committed to your well-being, it’s our responsibility to offer the safest, most affordable, highest-quality products for you. We seek to educate our customers on the negative effects of conventional hair care products. We believe great hair care products don’t need to have big price tags, and we are confident that Renpure is the best alternative. We believes not only in helping men and women to feel beautiful in their own bodies, but also in giving back. The purchases made through L'or D'afrique are sourced through a Women’s Cooperatives, which helps to sustain the natural ecology and livelihood of women in rural Moroccan villages. A portion of proceeds gained by the company goes toward local projects that benefit the communities of these women and help them to better the lives of their children and communities. It’s ritch of vitamin E & antioxidants, which are essential for treating & preventing acne, anti-aging, anti-wrinkle, anti-inflammatory, and reduces under eye circles. Argan oil is moisturizing natural ingredient. It’s helps with dry, nails and dry scalp. It moisturizes the skin, hair, and nails. It’s rich of essential fatty acids. This will keep the skin elasticity, reduce aging and wrinkles. Argan oil promotes hair growth and fix split ends. Argan oil is a dry, lightweight oil. So it’s not as “greasy” as other oils like coconut oil and olive oil. Argan oil is great for all hair types including color treated hair. it will add instant shine, the argan oil works as an anti-frizz serum. You can use argan oil for my moisturizer for the face and apply it day & night. Just one or two drops is all you need. Argan oil is a lightweight oil and the skin will soaks it up beautifully without leaving a greasy residue. when its apply to the skin during the day, you should let it sit as long as It can before you put on makeup .